We're restoring some old furniture - sofas with a lot of carving, whole wood book shelves, et al. We've stripped the old varnish and are redoing the job with poly. We did 2 coats of PU sealer and 2 coats of PU Matt, all with a spray gun. Most of the wood's teak stained with walnut, some of it is rose wood, so we're getting a nice dark brown. 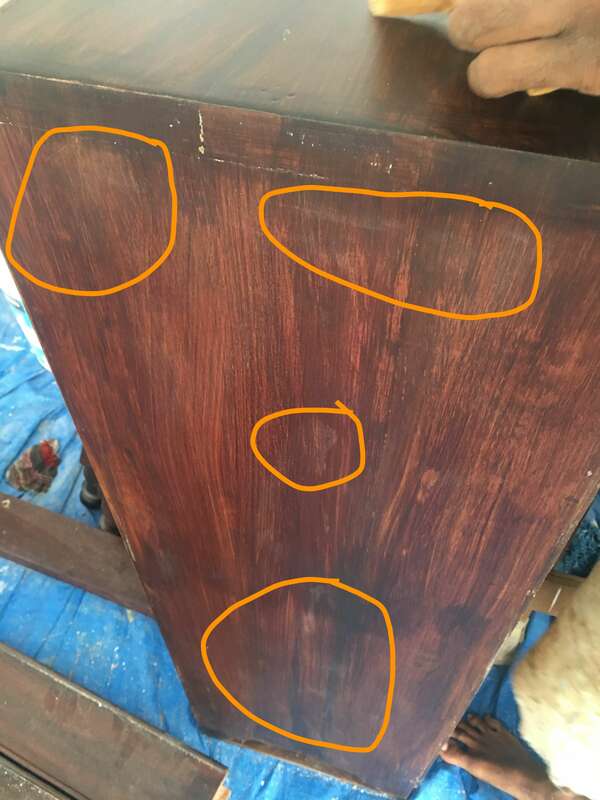 For some reason, when spraying the top coat say onto one side of say the sofa's arms / legs or a shelf's side, the other finished sides pick up rough grey patches. The contractor reckons it's air from the spray gun that's causing that and says it's inevitable when using matt PU. We'll be trying again by covering the finished sides with paper and painter's tape, but we can't do this with the sofa's arms / legs as easily. We also tried wet sanding with 1500 sandpaper - which removed the roughness, but left the grey patches - followed with 3m finesse it paste wax; it's too shiny for our liking and it raises the wood's grain, the grey patches / new scratches are now visible. Is this normal? If so how do we avoid these rough grey patches in the first place? The spray gun is generating an electrostatic charge in the spray and atomized particles are attaching to the nearby surfaces of the wood. It looks white because the varnish has been atomized (like a white mist). The lack of humidity is the main problem here. The dry air makes for low electrical resistance and charged particles travel further to negatively charged surfaces. ... how do we avoid these rough grey patches in the first place? I can’t think of any reason why this would be coming from within the wood itself. Whatever it is, overspray, dust, etc, it’s probably coming from the air. So to avoid it, try covering the surfaces you aren’t working on with plastic sheeting. You can stick it down with masking tape, or clamp it under a piece of scrap, or whatever you have that keeps it in place without damaging the piece (e.g. for legs throw a garbage bag over it and wrap some tape tightly around the top of the bag, whatever, be creative). You could also try tweaking ventilation and airflow if it’s overspray, e.g. a fan facing you might push the overspray at you instead of the piece. If you’re in a room with little/no airflow, then where things land is up to gravity, static, and the whims of closed air currents. Not the answer you're looking for? Browse other questions tagged polyurethane restoration or ask your own question. 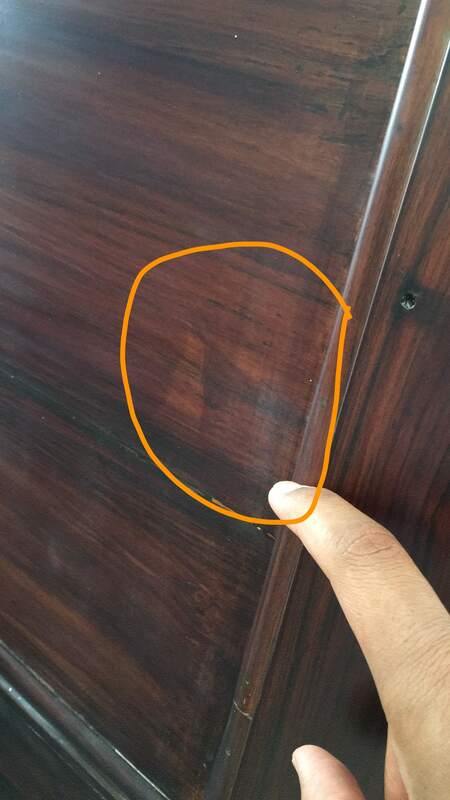 Why does my workpiece become rough again after applying polyurethane varnish when it wasn't before? Polyurethane clear coat is thickening to a jelly in the can! Moisture Blushing or Inadequately Mixed Satin Wipe-On Poly? 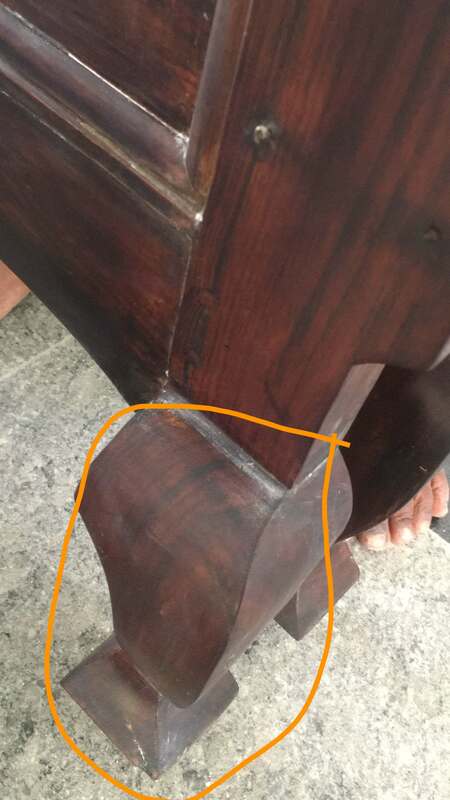 Can I put a clear polyeurethane coat on top of teak oil?